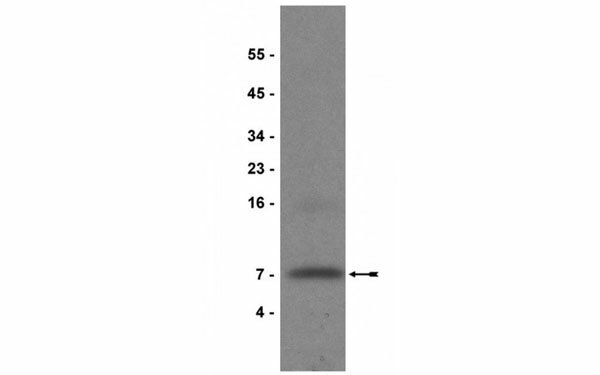 IGF1 antibody was purified by Ammonium sulfate precipitation. Lyophilized from 500ul of 0.1M tris-glycine, pH 7.4. Insulin-like growth factor 1 (IGF-1) is a polypeptide protein hormone similar in molecular structure to insulin. It plays an important role in childhood growth and continues to have anabolic effects in adults. IGF-1 consists of 70 amino acids in a single chain with three intramolecular disulfide bridges. IGF-1 is produced primarily by the liver as an endocrine hormone and targets tissues in a paracrine/autocrine fashion. IGF1 antibody was raised in mouse using human insulin-like growth factor I as the immunogen. Small volumes of anti-IGF1 antibody vial(s) may occasionally become entrapped in the seal of the product vial during shipment and storage. If necessary, briefly centrifuge the vial on a tabletop centrifuge to dislodge any liquid in the container`s cap. Certain products may require to ship with dry ice and additional dry ice fee may apply. Western blot analysis of IGF1 probed with anti-IGF1 (0.5ug/ml). 1. Local IGF-1 might play a role in the lesion- and deafness-induced plasticity in FC and at AN/FC synapse following chronic kanamycin-induced deafness.